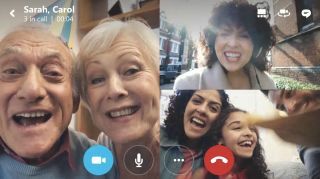 Microsoft is extending free Skype group video calling beyond the desktop, with rollouts to Android and iOS devices starting today. Group video sessions have so far only been available for desktop and Microsoft devices, though the company has been testing the feature for the other operating systems over the last few weeks. Microsoft says the new feature is optimized with HD video for phones and tablets, allowing you to change from a grid view to see everyone in the chat to a "focus view" that puts whomever is speaking in the large, background window. You can also pin one person there if you want them to hold the floor. The feature will roll out to North America and Western Europe in the next couple of weeks, though Microsoft says it will extend to the rest of the world in March. Microsoft is also increasing the amount of people you can have in a Skype group video call from five to 25. The company has confirmed the full group calling feature will be heading to Windows 10 Mobile after the roll out to Android and iOS. However, if you're a Windows 10 Mobile user, you'll be able to receive group calls right now, but will only see the active speaker on the call. Microsoft has been positioning Skype as the go-to video calling app for a few months now. It introduced an invitation feature in October, allowing Skype account holders to invite anyone they wanted to a browser-based Skype chat without the invitee needing an account. This feature is also rolling out to Android and iOS devices. Combined with group video calling for mobile, Skype could become a formidable foe against options like Google Hangouts and Apple's FaceTime.